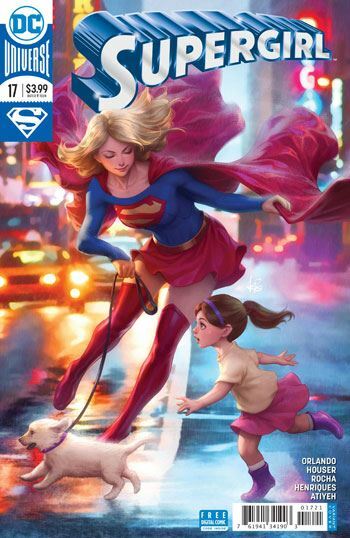 Supergirl 17 has great art. Really. I love looking at this story. Much more than I enjoy reading it. Not that it is a particularly bad story, it just feels very by the numbers. As I have commented before, the way it tries to incorporate elements of the tv series, without actually duplicating the relationships from the show, gives the whole thing an awkward feel. Supergirl battles two enemies sent out by Director Bones. 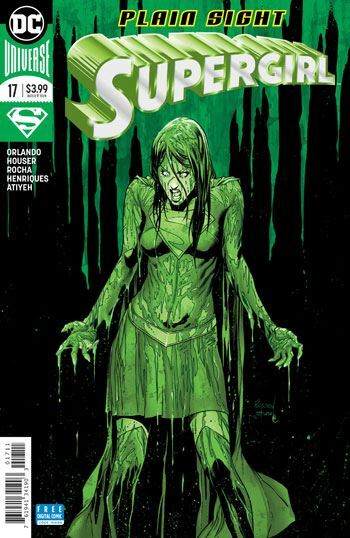 That is so wildly different from last issue, in which Supergirl battled two enemies, sent out by Director Bones. You can see where I am going with this. And where Houser and Orlando are going as well. The only part that piqued my interest was the scene with Bones and Mokkari. That was fun. Otherwise, this was well worth looking at. I found myself really examining the art to a much greater degree than I usually do. Just because there was nothing else grabbing my interest. I also sort of cringed at the next issue blurb, which announces a villain called the Evolutionist. I know this is an American comic, but are we really going to descend into Creationist nonsense now? Pandering to Trump sucking Christians may be good for the market in the Bible thumping areas, but it’s repulsive to anyone with a brain.